You can programmatically scroll an item in a ListBox into view by using the ListBox.ScrollIntoView method. 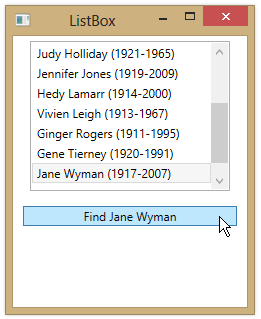 In the example below, we scroll the actor Jane Wyman into view when the user clicks the button. 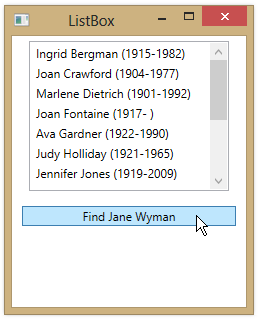 <ListBox Name="lbActors" Margin="15,5" Width="200" Height="150"
<Button Content="Find Jane Wyman" Margin="10"
In the Click event handler for the button, we use Linq to find the Actor object for Jane Wyman and we then call ScrollIntoView.